One of the nicest guys you could meet. 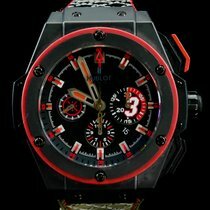 He must be, or Hublot wouldn't honor him with a Limited Edition watch bearing his name, now would it? This watch is a 48 mm High Tech Chronograph, has a huge presence and is incredibly light for its size. 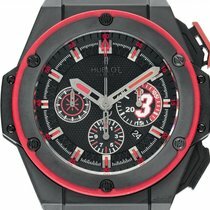 With the red accents on the dial, bezel, pushers and strap it stands out in the crowd. It looks good and you will look good wearing it. The watch is complete with original box, papers, and signed #3 jersey!